Deuteronomy 4:9 " Only take care, and keep your soul diligently, lest you forget the things that your eyes have seen, and lest the depart from your heart all the days of your life. Make them known to your children and your children's children." SAS ( Samraong Adventist School) is under the CAM ( Cambodia Adventist Mission) control. It is in the system of education in the CAM, which is the CAM president was Mr. Deane Jackson and his beloved wife Ruth Jackson. They are from Australia which called by God as He chose them to work and to lead people in Cambodia for His Kingdom. 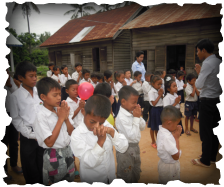 Not only SAS, but there are many Adventist school for Cambodian children around this kingdom of Cambodia. Mr. Pr. Deane was a faithful, humble and eager in his leading as the CAM president. Never get tired in helping this country to bring people to God. it was a very big challenging for him and his wife as the CAM president all around Cambodia. By their faithfulness to God many became Seventh-Day Adventist. God needs us to finish His work, to harvest and to bring people for the Kingdom of God. There are many works more and needs for Cambodian. We are God's helping hand. SAS ( Samroang Adventist School) was born since 1997 in the time of civil war in Cambodia. The school were made from wood and the roof from zinc. It used the wooden chairs and table and the green board with chalks. It is also sponsor and help from salt ministry and the CAM during that time. The school was lead by Naro's family as the church and school principal. They live in the school campus and leading young and old people weather in school and church. He and his family lived there for more than 15 years. God sees his work and God retire him and given him a very beautiful house with his family to stay. God bless him and happy with his work, but as he is old and tired. God gives him rest. As the school doesn't run well because of Naro is getting older and he cannot continue on the work, so the CAM had met together and discussed about Samroang school and find someone to help. If no body want to work there, they will need to close the school or keep it because there are no body wants to come here and work. The other reason is because it is far from the family, and most of them love to live in Phnom Penh better than here. Mission had discussed together and plan to sell this land and get the money to help other parts of Cambodia for God's work. But God knows that here in Samroang needs also people to be educated and know Jesus. God had work to a family's heart and they want to come here to work and leading in church and school in the end of 2011. First, they are hesitated, but as they spent more time in praying and ask God in leading. Then, God chosen them to work here till now. Later on in 2012, the school here in Somraong need somebody to take care as the principal of the school. Pr. Vannak and his family have many work to do in the church as the district leader for all churches in this province ( Addor Menchey). The Mission had thought about Samroang and need some helpers for the school. During that time, the 12 grade in Salt Ministries had done their studies and graduated (grade 12 graduation picture). Mr. Deane Jackson, the CAM president came down to Siem Reap and talked with Mr. Tim Maddocks, the Salt Ministries leader, and the 12 grade about the work around Cambodia and asked them if they want in helping. Then, there are no answers from the 12 grade. Some of them wanted to come but they need to continue on with their study in college and university. Later on, there are no one from the 12 grade in Salt Ministries come, but one did!! There is Mr. Mao Chantha who willing to go on and work for Jesus. He has the commitment to God and want to serve Him wherever God wants him to go and do His work.During that time just before he came to Samroang, he had been praying very hard for the Lord to lead him and for him to be brave in leading. 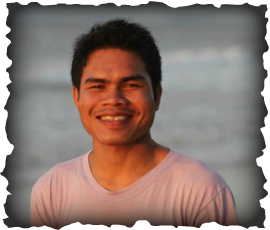 It kinds of challenging for him as a young man only 23 years old-single, no the decree, just finished grade 12 to be a school principal which chosen by the CAM ( Cambodia Adventist Mission). By the way, Mr. Mao Chantha had done his work and succeed for a year in 2012-2013!!!! Praise the Lord for His leading in the school.